The LP Rotate with EVO has been specially designed for people with long residual limbs, which have insufficient clearance for the Re-Flex Rotate with EVO. 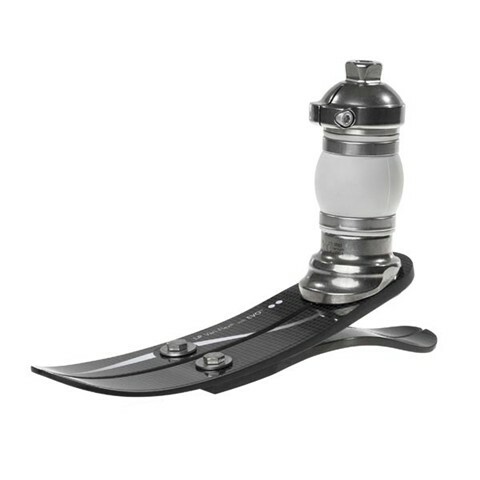 This compact energy-storing foot offers rotational shock absorption designed to reduce shear forces on the residual limb. The Rotate shock module is combined with the LP Vari-Flex foot module. Össur's EVO feature enables the full potential of the foot plate to be realized with every step, helping to enhance natural gait progression. CARBON-X Active Heel - The Carbon-X Active Heel stores the energy during loading response as the amputee transfers his or her body weight onto the prosthetic foot. Energy is gradually released from the heel providing optimal return for forward progression of the limb. EVO - The EVO (Energy Vector Optimization) feature is generated by controlling how the ground reaction force is transferred to the prosthetic foot. Each step is optimized through the magnitude, placement and direction of forces for maximum efficiency. EVO enables the amputee to develop the most natural gait progression possible which reduces fatigue and puts less pressure on the sound side. Full Length Toe Lever - The full length keel/toe lever matches the length of the sound foot, providing improved support to the prosthetic limb during late stance. It ensures that users spend equal time on the prosthetic foot and natural limb, thus providing improved walking dynamics and reduced impact to the sound limb. Rotation - Trunk rotation is essential for good gait dynamics. If rotation is limited by loss of joints and the prosthetic interface, gait dynamics and comfort are compromised. Rotational forces are translated to more proximal joints and to the residual limb. Rotary torque absorbing components assist in restoring rotation thus improving joint health, comfort and gait dynamics. Split Toe - A split toe feature allows the foot to adjust to uneven surfaces, allowing amputees to walk with stability and comfort on uneven ground. Vertical Shock Pylon - The vertical shock pylon reduces impact to the residual limb, joints and lower back during daily activities. It also ensures a more energy-efficient gait by minimizing vertical displacement of the center of gravity. Copyright © 2015 Shreveport Prosthetics. All Rights Reserved.